Hidden inside the Circa 1857 Art and Architecture antique shop is a quaint little eatery called Yvette Marie's Cafe. Run by the same culinary experts that do Bonanno's Fine Catering, Yvette Marie's specializes in soups, sandwiches, salads, hot lunch specials, and desserts! Last week I journeyed to Yvette Marie's for my first time along with two of my favorite lunch dates, Natalie and Laura. The building itself is unique and eclectic with a very old school feel. The old wooden floors and exposed wood rafters highlight the cafe and make the diner instantly feel at home. At Yvette Marie's, the patron places their order at the counter and can then go sit in one of the multiple dining areas. 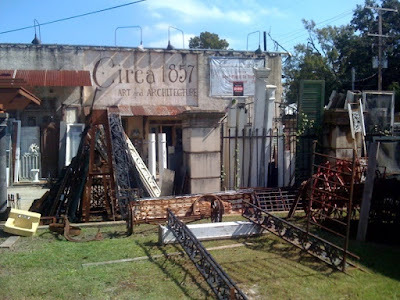 The weather wasn't perfect for outdoor dining, so we ventured upstairs to a room that is befitting of an antique store. They also rent the space out for private dinners and parties, which would be a pretty cool venue. I ordered a special soup of the day and a sandwich off the menu. The Crab and Leek Soup was creamy and spectacular. If they had it on their everyday menu I would suggest going just to try it. Since it was a special, I'll suggest going and trying whatever they happen to have! If the rest of their soups are this good then you certainly won't be disappointed. I also ordered the Jalapeno Chicken Sandwich, which can be found on their every day menu. 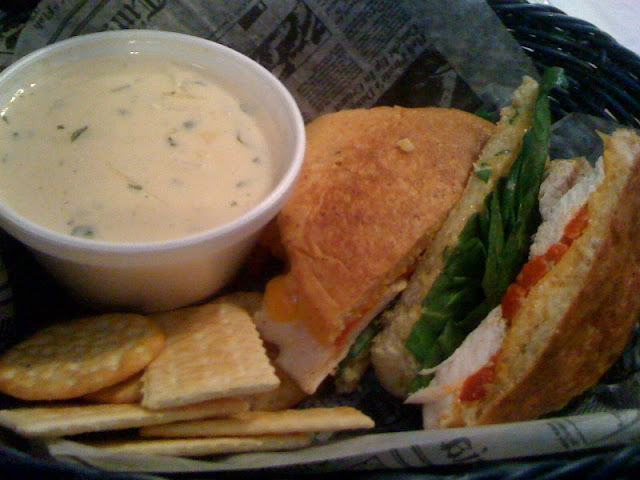 The sandwich featured grilled chicken breasts, spinach, roasted red peppers, cheddar cheese, and garlic aioli on a jalapeno cheddar roll. This sandwich was money! The bread was soft and flavorful with just enough kick to make you know the jalapeno is there but not so much that it is overpowering. The chicken was perfectly moist and tender while the roasted red peppers and aioli gave the sandwich a certain pizzazz that set it apart from other sandwiches. I was very impressed with the sandwich and would certainly be willing to go back and try some other ones... or eat that one again! And of course, what meal of this caliber would be complete without a little something sweet at the end? On this day Yvette Marie's had a homemade strawberry cheesecake that I just couldn't pass up as it glared at me from its perch on the counter. The cheesecake had a graham cracker crust, silky cream cheese center, large chunks of fresh strawberries, another layer of strawberry filling, and then white chocolate shavings sprinkled on top. 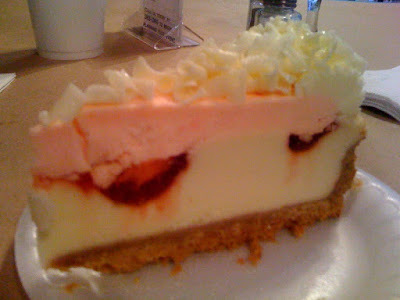 The strawberry cheesecake tasted as delicious as it looked and, sharing with Natalie, it was devoured in record time. I freaking love cheesecake (hint hint to anybody who wants to make the blog)! Yvette Marie's is one of my favorite places to eat in BR! LOVE their food!! And you can't beat the atmosphere! Love the musician that plays there! He plays an assortment of instruments, and is GREAT! Has DVS's for sale.